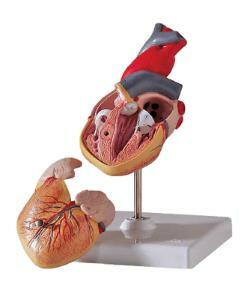 Smaller than an adult heart, the model features a detailed portion of the aorta and the major veins. The front can be removed to reveal the chambers and valves including the chordae tendinae. The two-piece model is mounted on a stand and includes a key that identifies 16 structures.